Seeing a park built on the West Side of Asbury Park is at the top of the to-do list for city council members. Following a presentation City Engineer Joe Cunha gave at the Jan. 28 council meeting on the status of the project, council members stressed there is no reason, after over five years in the planning process, the park shouldn’t be complete post haste. Ideas for the creation of an area for recreation on the city’s West Side began in 2004. Councilwoman Quinn stressed that within the same time the city has seen the Vive townhomes built and developers break ground on two more housing complexes, Springwood Park is still empty. Part of the issue, according to Cunha, was securing funds for the total project cost of about $2.5 million. In order to do so, Monmouth County officials allowed the city to split the project into three phases and apply for partial amounts of the total grant funds within three consecutive years, an unprecedented decision, according to Cunha. An environmental remediation study was completed on the project Wednesday, Cunha said. With funding secured, he expects to go out to bid for the actual project construction by Feb 12 and break ground before Memorial Day. “With the closure of remediation complete, by the second [council] meeting in February we should be out to bid,” he said. 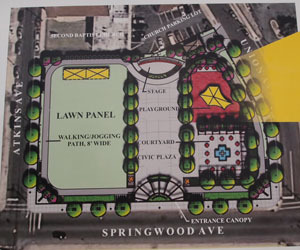 The park is slated for Springwood Avenue on the block between Atkins and Union avenues. It will contain a civic plaza with a courtyard and fountain, a raised stage area and artificial turf area for pick-up soccer games and other recreational activity. A playground has already been built on the site [shown above during the construction phase]. A $107,515 contract was awarded in June 2014 to Suburban Consulting Engineers, Inc., for design, bidding and construction administration purposes. Mayor John Moor said if previous city council members knew the Springwood Park project would have taken this long, they probably would have bonded for the total amount to see it built and the city’s redevelopment progress continue on the West Side. City resident Teretha Jones thanked Quinn, and agreed the project deserves a spot at the top of the priority list as there is a perception among West Side residents that the city seems to be dragging its feet on the project. “This needs to be expedited. Period,” said Jones.